The Frozen Four was stolen away from Michigan in traditional 2009-2010 fashion as the refs called back the game winner in overtime because they're refs and we're Michigan. I was watching the game with two people that patently Didn't Get It, one of whom is a girl that claims to know lots about hockey--she, Canadian, was particularly proud of the Canadian gold medal and made sure to rub it in people's faces despite what seems to be a pretty elementary understanding of the game; but I digress. I had tweeted sometime during the game that it was obvious that game was headed toward heartbreak. That's just how things have been going for us. You know the rest of the story. I sat in a living room with my head buried in my hands, trying to collect myself from the personal and fanatic agony of the day. The people in the room with me were palpably uncomfortable. Next up, spring practice, where your main source of information is MGoBlue's various Inside Michigan Football episodes (that MGoBlog refers to as browser crippling; thank God I'm not the only one) and reports of Player X being dramatically improved and fighting for a starting spot. This year's videos have been utterly terrifying as every single offensive play goes anywhere from 10 to 80 yards. I have to assume these are not isolated incidents. This defense is going to be worse, despite my rumblings to the contrary. But per usual, there's no real news right now. Denard is playing with the 1s. Devin Gardner is in a sling. Running backs are running. Newz! And in vaguely related Michigan news, EA Sports thinks Kevin Grady and Greg Matthews are still on the team. 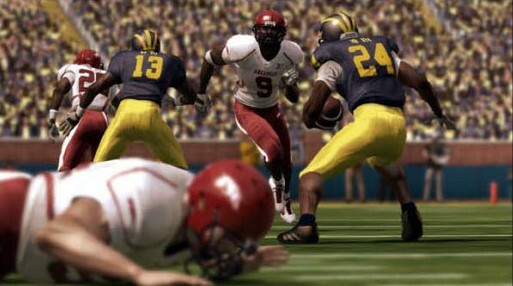 NCAA 11 will likely also see the return of Jake Long, Braylon Edwards, and Morgan Trent. Most of the images have us doing cool things like beating Arkansas, leaving tiny defenders wallowing face down on the ground. I warn you though, do not watch the video. You've never seen Donovan Warren not tackle so many Buckeyes. Oh wait, no, you probably have.